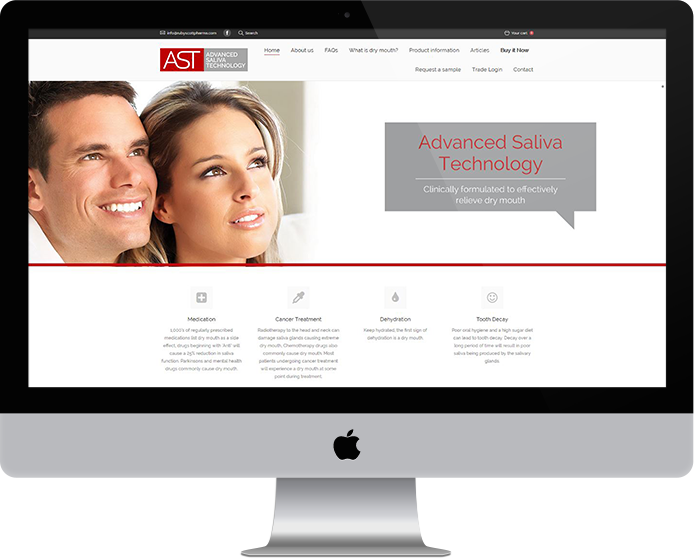 Under the name of Advanced Saliva Technology, Ruby Scott Pharma Ltd specialises in pharmacy oral care. Having collated a wealth of experience and knowledge in the field of dry mouth, the company delivers a range of solutions across clinical areas including oncology, palliative care, dentistry, stroke, care of the elderly and autoimmune diseases. Our brief was to build an e-commerce shop for trade and direct sales from the website, including options for international ordering from clients around the world. From an initial brief, we created a brand new design and branding for the website and e-commerce shop, creating a fresh and professional appearance and feel. For the e-commerce shop we created a platform full of functionality, including a form to request product samples, a blog and trade log-in areas. The trade log-in function was particularly important, as it enabled customers with certain credentials to take advantage of reduced prices. A key element of the shop was to enable international delivery across the world. This mean the ability for users to see prices and pay in different currencies was essential. We integrated this feature, where currencies are updated daily from international rates and applied directly to the prices displayed on the website. The result is a new online shop that helps to promote the Ruby Scott Pharma’s AST products to a wide audience, and enables both trade and personal customers to buy the products directly. This has in turn boosted sales, and enabled greater access to the benefits the products offer.